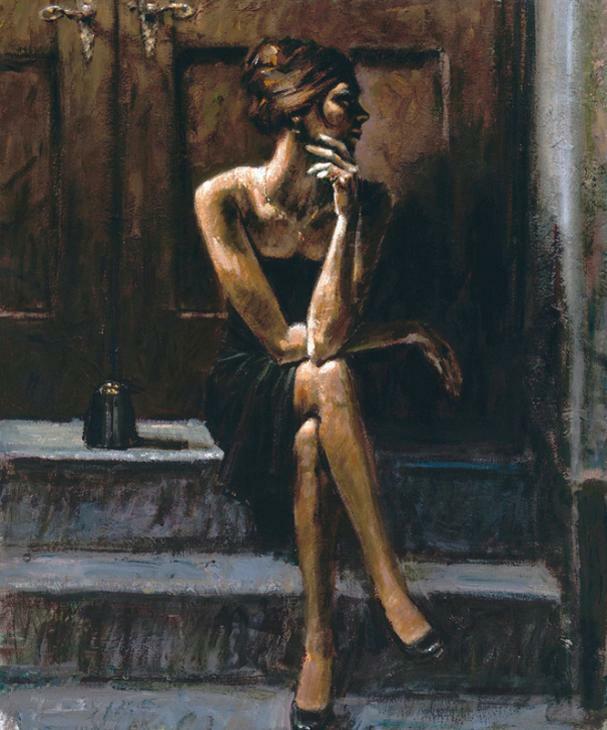 Here, Perez's use of chiaroscuro - a study in contrasts of dark and light - immediately provides a very mysterious, sensual setting. 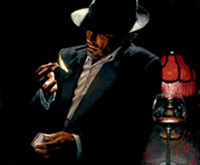 This setting recalls the attraction Perez had as a youth with his father's shadowy yet sophisticated lifestyle, something he projects to his audience with almost every work he creates. Also, notice that the woman is turned away	and does not make contact with Perez's (and our) gaze. This detail, present in almost all of his works that I have viewed, is able to express two main things: the lack of confidence and/or the possession of it. For the first instance, the woman is seen as avoiding the onlooker's glance, retreating into herself and being ashamed of her position. The other stance (which I believe is more accurate) is the woman conveying her insouciance or elegance - her attitude is not defiant or pleading, but personal and multifaceted. 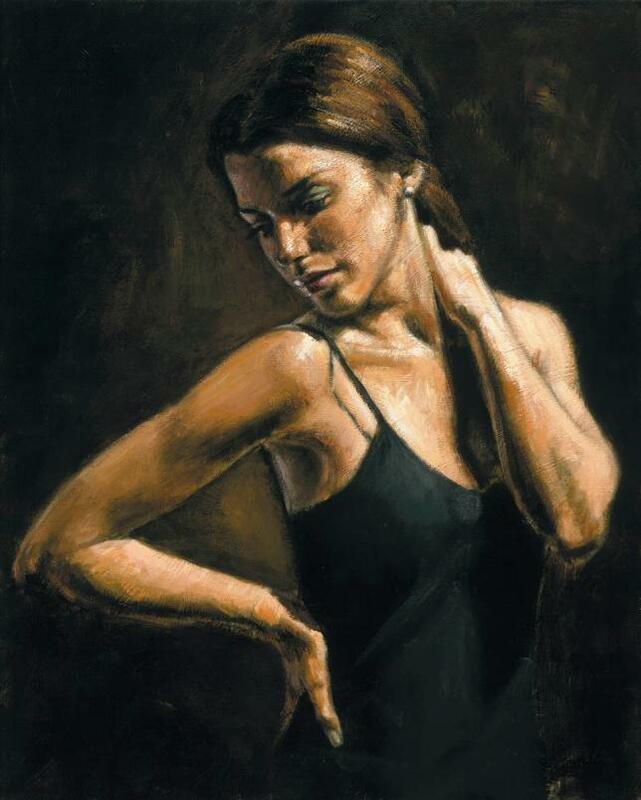 The woman in this picture and the many others Perez paints exude common qualities - they are not flashy in their sensuality, and are not, at first sight, recognizable for what they are or do. These women appear as real people instead of the objects they are typically seen as, which gives a fresh and surprisingly deep perspective at a world often given over to taboos. This is what I believe to be the main draw to Perez's artwork - he has the gift of bringing a complicated and traditionally negative subject to life, giving it dimensions, and making it beautiful and accessible to the public. Other subjects he paints such as lonely bar ventures and Japanese geisha culture perform similarly. 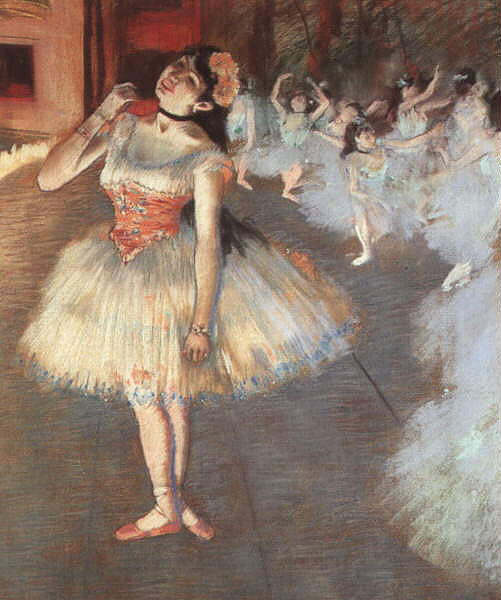 In looking at the portrayals of prostitutes by other artists, Edgar Degas is a featured target. Though his paintings mainly featured ballerinas, there are particular elements of the prostitution culture throughout his female-focused works. In Charles Bernheimer's article entitled, "Degas's Brothels: Voyeurism and Ideology," he references theorist Paul Valery who talks of how "Degas's passionate commitment in creating the danseuses, he argues, involved the display of female slavery rather than the elision of the body's travail in the glory of its aestheticization" and that "the dancers, like all the other female professionals Degas painted, be they laundresses, milliners, or cafe-concert singers, were known to be involved in clandestine prostitution" (Valery qtd. In Bernheimer 159). Degas characterizes one side of this artistic focus, one that, in its misogyny, makes a slave out of the woman, a figure to be contorted and objectified. As seen in this painting entitled "The Star," despite the traditionally elegant subject matter, these women are portrayed in awkward and somewhat compromising positions that do not empower them but rather leave them emotionally bare. There is a shaded simplicity and skill evident in Degas's work similar to that of Perez's, but the attitudes and perspectives given by each artist are vastly different. Another artist considered for his portrayals of women and prostitution is Edouard Manet, specifically his iconic work, "Bar at the Folies-Bergere." Here, the woman featured casts an image of self, more like Perez's work, but with the added tension of her line of work being her main identity. She is shown as a salesgirl, with tired eyes and plain expression that communicate a singular interest in business for business' sake (Iskin 26-27). Unlike Perez's portraits, the woman in this painting looks at us/the artist head-on, establishing a simple visual exchange in the midst of a complicated subject. Here, the painted prostitute seems to call for more of our sympathy than our horror, curiosity, or respect. 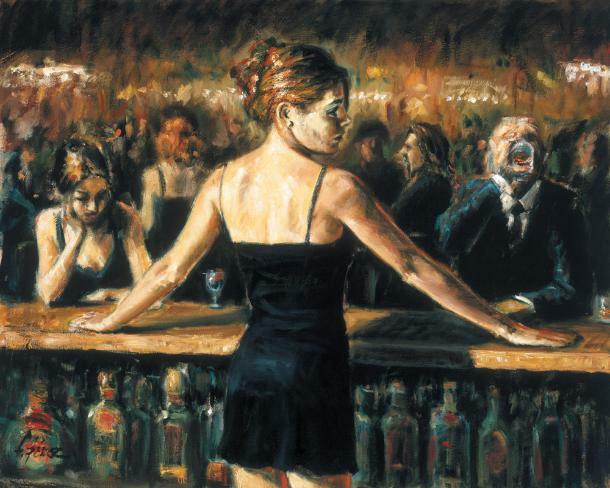 Looking at "Bar at the Folies-Bergere" in contrast to one of Fabian Perez's works of a similar visual composition, we can see the subtle differences in not only the style and medium of the two artists, but the expressions and emotions of their subjects. "The print presents a naked white girl sitting in the lap of a grotesque black hag, who symbolizes the dominance of prostitution as profession. One of the young girl's legs is provocatively draped across that of the older naked woman, who firmly holds an arm of the girl - much like a prisoner - with her clawlike hand. The action takes place on a bed whose drapery (or canopy) is pulled aside to reveal the figures. 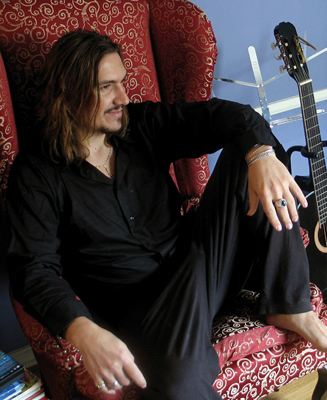 The hideous hag has taloned feet, which rest on bags or pillows. She stares outward, directly at the viewer; the young maiden, eyes averted, presents a more demure, deliberately innocent, impression" (Weisberg 45). Examining this artwork, the white woman is real and has emotions and dimensions and life, but is being stripped of those things by the monster that is her profession and the corroded future it entails. 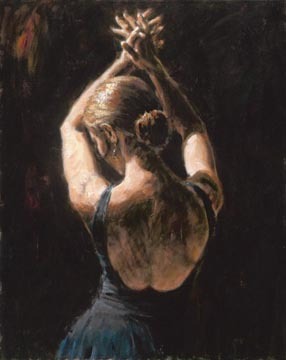 The prostitutes in Fabian Perez's paintings are shown to be still very much linked with their profession in their attire and sexual attitudes, but instead of being stripped of their depth, Perez shows each woman as multifaceted and real in conjunction with her incredibly base and straightforward line of work. There are definitely other areas to explore, but the final representation of prostitutes in art that I will touch on is that of subtle distinction. Going back further than artists of the 19th-21st centuries to the images of prostitution in the late 1400s, we see that these images rely heavily on context and detail in order to express their true intent. In the era of Michelangelo, representations of half-naked women were common subjects for art, not simply promiscuity. However, for paintings like Palma Vecchio's "Portrait of a Woman," certain elements clue the viewer in on the woman's professional nature (Knauer 102). First of all, the simple, unadorned clothing speaks to her class. Her hand draws the cloth back, revealing her breast and making it obvious to the viewer whereas other, less-sexualized artworks do not make naked parts as blatantly centralized. The woman's gaze is direct, but the fact that her head is turned signifies coyness and perhaps even fear. She offers something to the viewer, but in a subtler, more nuanced fashion than the woman pictured at the Folies-Bergere. Bernheimer, Charles. "Degas's Brothels: Voyeurism and Ideology." Representations 20 (1987): 158-86. Print. 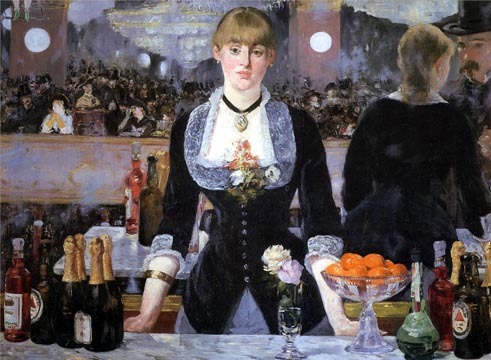 Iskin Ruth E. "Selling, Seduction, and Soliciting the Eye: Manet's Bar at the Folies-Bergere." The Art Bulletin 77:1 (1995): 25-44. Print. Knauer, Elfriede Regina. "Portrait of a Lady? Some Reflections on Images of Prostitutes from the Later Fifteenth Century." Memoirs of the American Academy in Rome 47 (2002): 95-117. Print. Weisberg, Gabriel P. "Louis Legrand's Battle Over Prostitution: The Uneasy Censoring of Le Courrier Francais." Art Journal 51:1 (1992): 45-50. Print.